Thank you for viewing my Monthly Writing Words product! 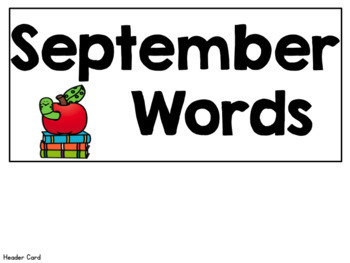 This product contains themed words for the months of September-June! My kids look forward to seeing the new words posted each month! The included words are seasonal and most are difficult for young learners to spell on their own. This product helps young writers practice using their environment as a strategy for spelling tricky words. Plus, it makes writing that much more fun! I even find my kiddos using the word chart to write in their “free” time. SCORE! There are no lessons associated with this product, it is a resource that can be used as a supplement your writing lessons or centers. This product can be setup as an interactive word wall or a stationary chart. 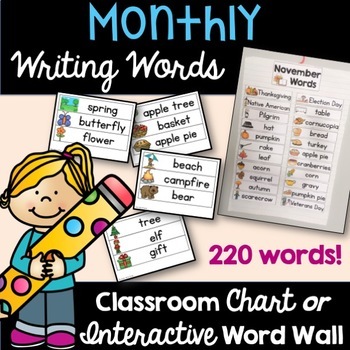 You will change the words/chart each month. 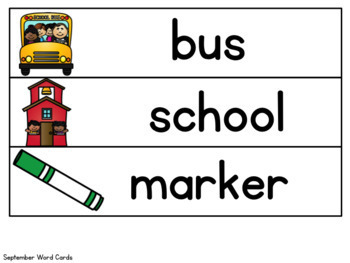 The chart/words should be in a place that is easily visible and accessible to all students. If using this product as an interactive word wall, students are able to physically take the word they need to their writing spot. Once they are finished with the word, they will return the word back to it’s “home”. 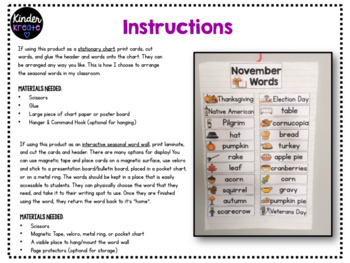 · Materials list- not all materials listed are needed, it depend on how you plan to display the words each month. I have a November FREEBIE sample available for download.